GK Safety provides a comprehensive selection of Health and Safety training Courses and Consultancy services throughout the UK. Our remit is to provide high quality courses to meet our clients needs at an affordable price. Deliver health and safety training in discussion with the client, which is relevant and specific to each organisations operations. Provide risk assessment training to enable all grades of staff to have the confidence, knowledge and skills to produce risk assessments for their work areas. Our fire training courses range from fire awareness to fire warden/Marshal training. We also carry out fire risk assessments and deliver fire risk assessment training. We provide HSE approved first aid training across the UK. 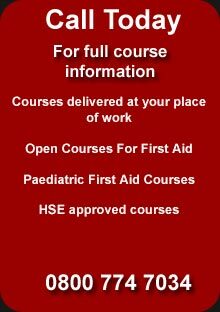 Ranging from first aid at work courses to 1 day emergency first aid and paediatric first aid. Manual handling training to reduce the risk of injury and comply with organisations legal responsibilities. First aid provision in the workplace saves lives and can prevent minor problems or injuries from becoming major ones. It can help employers reduce costs from injury. And it is a legal obligation for every single employer to make sure their employees receive the right first aid care in the workplace. GK Safety offer a number of training Courses throughout the UK and the London area. GK Safety have a flexible approach to training and can make any First Aid Training Course Specific to the clients needs. Employers have both a legal requirement and a moral duty to provide Health and Safety Training / Provision.